Five decades ago, July 20, 1969, one man from the planet Earth fulfilled his vision of landing safely on the surface of the moon. It was neither Neil Armstrong nor Buzz Aldrin. Their mission was to plant the American flag for another man who did not make the trip. In fact, he hadn't lived long enough to make the journey himself or witness the success of those who stood in the bright sunlight of Tranquility Base. Yet, it was he who had inspired a hundred million people to reach for the moon and actually touch it in the space of a decade. President John F. Kennedy did more than land the Eagle. He transformed the nation in the process. On May 25, 1961, President Kennedy stood before a joint session of Congress to declare it "time for a great new American enterprise -- time for this nation to take a clearly leading role in space achievement, which in many ways may hold the key to our future on earth." Timing, as they say, is everything. Americans were rattled on October 4, 1957 when they heard the beeping of the Russian Sputnik on television and then rushed outside to see it moving through the stars above their own homes. That just couldn't be. We won the war. We built the bomb. We were the best, the brightest, the most deserving. Weren't we? Our national ego had been bruised, even crushed. Collectively we yearned to prove again that we could do anything we put our minds to. Kennedy knew he had command of one of those rare teachable moments. An entire population would give its rapt attention to any plan of visionary leadership, even one that might sound far fetched, even impossible. Of his entire Special Message to the Congress on Urgent National Needs, these two sentences would become famous: "First, I believe that this nation should commit itself to achieving the goal, before this decade is out, of landing a man on the moon and returning him safely to the earth. No single space project in this period will be more impressive to mankind, or more important for the long-range exploration of space; and none will be so difficult or expensive to accomplish." In fact, "the goal, before this decade is out, of landing a man on the moon and returning him safely to the earth" became a national mantra. The part about being so difficult or expensive to accomplish paled in comparison with the parts about being impressive to mankind and important for the long-range exploration of space. A less visionary leader might have merely asked for funds to maintain our technology at the same level as the Soviet Union and let it go at that. But Kennedy asked for the moon, and the nation went wild with enthusiasm. The logic behind Kennedy's thinking is also shared within the context of that speech. "I believe we possess all the resources and talents necessary. But the facts of the matter are that we never made the national decisions or marshalled the national resources required for such leadership. We never specified long-range goals on an urgent time schedule, or managed our resources and our time so as to insure their fulfillment." Actually, we had done exactly those things when threatened by an escalating World War II and in development of the Manhattan Project, the atomic bomb. What President Kennedy did was to inspire the nation to behave in the same way, not merely for the threat of being conquered by other peoples but for the pursuit of a dream "impressive to mankind." Within the next eight short years, the nation transformed itself. All of a sudden students were getting more homework and education was taken more seriously. A college degree became the ticket to success. To be a space scientist or engineer was to be among the elite. The astronauts were national heroes, the space missions were a national pastime. Hundreds of thousands of demanding, high paying "brain jobs" were created in the space program and in education to support it. We became a nation of technology. Everything was transistorized, automated or backed by scientific evidence. On September 12, 1962, John F. Kennedy gave a follow-up address at Rice University on the Nation's Space Effort. Again he reinforced the vision, by revisiting the question "But why, some say, the moon? Why choose this as our goal?" A nation still rapt with attention attached itself to his answer and made these words almost as famous at the moon challenge speech. "We choose to go to the moon. We choose to go to the moon in this decade and do the other things, not because they are easy, but because they are hard, because that goal will serve to organize and measure the best of our energies and skills, because that challenge is the one that we are willing to accept, one we are unwilling to postpone, and one which we intended to win, and the others, too." Kennedy knew he would get to the moon, and we would too. In that first speech, the one that made the challenge, he added "It will not be one man going to the moon -- if we make this judgment affirmatively, it will be an entire nation. For all of us must work to put him there." We got there on July 20, 1969, just as we were inspired to do. The Last Man on the Moon , Astronaut Eugene Cernan and America's Race in Space - by Eugene Cernan; Don Davis. A revealing and dramatic look at the inside of the American space program from astronaut Eugene Cernan, one of its heroic pioneers. With photos. Countdown; A History of Space Flight by T. A. Heppenheimer. The race to put a man on the moon provided the perfect metaphor for scientific achievement, one that challenged and captured the public imagination. Yet in addition to its science-fiction glamour, the space race served equally powerful and social objectives. 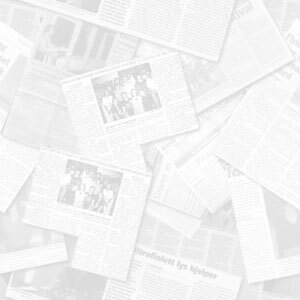 Countdown provides the first overview of the period that explores the achievements and failures of all sides of the space race in their full historical context. The Race: The Uncensored Story of How America Beat Russia to the Moon by James L. Schefter. A young reporter for Life magazine at the height of the space race had access to all the inside stories of the astronauts and the missions...but he couldn't tell the really juicy stuff then. Now he does in this uncensored memoir of what really happened during "the race." A Man on the Moon by Andrew L. Chaikin, Foreword by Tom Hanks, producer of the HBO television series "From the Earth to the Moon." 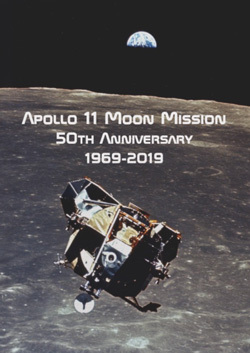 (see banner above) This book tells the story of the Apollo moon missions as told through the eyes of the astronauts and others intimately involved in one of mankind's great adventures. Full Moon by Michael Light. Stunningly beautiful images scanned directly from NASA master negatives and transparencies. Here are 129 of the best photographs taken by the astronauts of the Apollo moon missions. Includes five 45-inch-wide gatefolds displaying the lunar landscape with breathtaking detail. 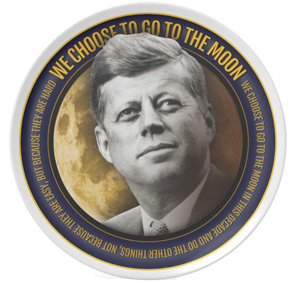 Apollo 11 Gift Shop - Souvenirs featuring the image of President John F. Kennedy, similar to the commemorative plate above, and other items of interest. Historic Apollo 11 Moon Mission Gfits - Souvenir buttons, stickers, t-shirts, similar to the image above, and more designs celebrating the 50th anniversary of this one small step that changed the world for all of us. John F. Kennedy Library - Official site of the library and museum dedicated to President Kennedy. Kennedy Space Center - Everything you need to know about what's happening at KSC and the Visitor Complex.. The Power of Not Giving Up - Astronaut Alan Shepard's boyhood dream of flying propelled him into America's first space mission, but persistence against incredible odds took him to the moon. Astronaut Jerrie Cobb, Our Other American Legend - Jerrie Cobb was one of the Mercury 13, our first female astronauts, who never flew in space.